You can get a lot of "mileage" out of SAA Voyager Miles if you know how :) We have more options now that SAA Voyager Miles can be used to discount Mango airfares, but it also means that life has got a bit more complex. As we predicted this has become really popular, and we've had several clients ask whether they should use their SAA Voyager Miles to discount Mango Airlines flights, or opt to use them in the original manner on standard South African Airways flights. So, we decided to carry out some research. The short answer is that 1000 Voyager Miles saves you some R45 on Mango flights, and an estimated R30 to R80 on South African Airways flights (we'll explain why the savings varies on SAA flights). SAA Voyager Miles can be used to pay for the base fare of a Mango Airlines flight (ie it cannot be used to pay for airport taxes) or the base fare of a South African Airways flight. The base fare of Mango Airlines flights are a much larger percentage of the total fare than the base fare of SAA flights (do you see where I'm going with this?). An OR Tambo to Cape Town flight on the 16th April 2014 which costs R984 straight, could instead be paid for with 18,000 Voyager miles plus R165.00 for taxes. An OR Tambo to Durban flight on the 14th August 2014 which costs R694, could instead be paid for with 12,000 Voyager Miles plus R165.01 (don't even ask me about why this is 1c more than the taxes for the JNB to Cape Town flight - I have no clue). It seems each 1000 Voyager Miles saves you roughly R45 on Mango flights. One would expect an SAA flight from Johannesburg to Durban to cost fewer Voyager miles than an SAA flight from Johannesburg to Cape Town, but there is no such differentiation. Since you use the same number of miles on the expensive routes, as on the cheaper routes, you may as well target the use of your Voyager miles for the expensive flight routes. This compares to the system on Mango Airlines, where Voyager miles used differ depending on the price of the flight. 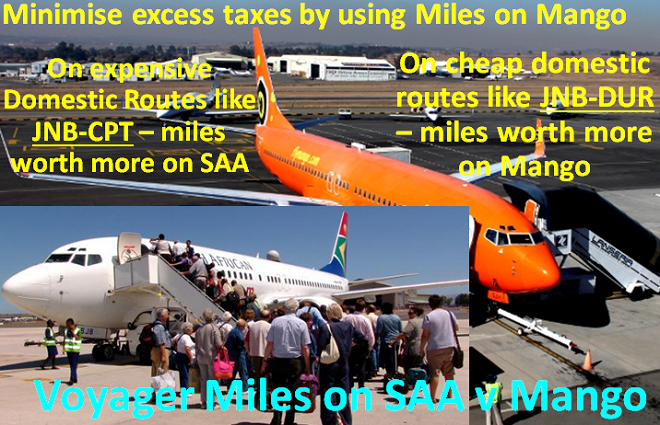 The cheapest SAA flight with Voyager Miles is a Mileagekeeper 1-way flight, which you can redeem for 9,500 miles; but that is only in class X. I phoned up the SAA Voyager call centre and said I'd like to check availability for Johannesburg to Cape Town on the 15th May. Interestingly enough they first pointed me to a Mango flight, even though there was a class X South African Airways flight on the same date. SAA333 at 12h00 from JNB to CPT I could book with 9,500 Voyager Miles plus R746. Since the standard fare is R1376, this means that 9,500 Voyager Miles is equivalent to R630. If you'd like to minimise the excess that you pay for your flight over the base fare, then use your Voyager Miles on Mango flights, as the airport taxes and carrier charges are lower than for SAA. On dates & routes where airfares are expensive, like Johannesburg to Cape Town, SAA Voyager miles may save you more on South African Airways flights than on Mango Airlines flights. On cheap flight dates & routes, e.g. 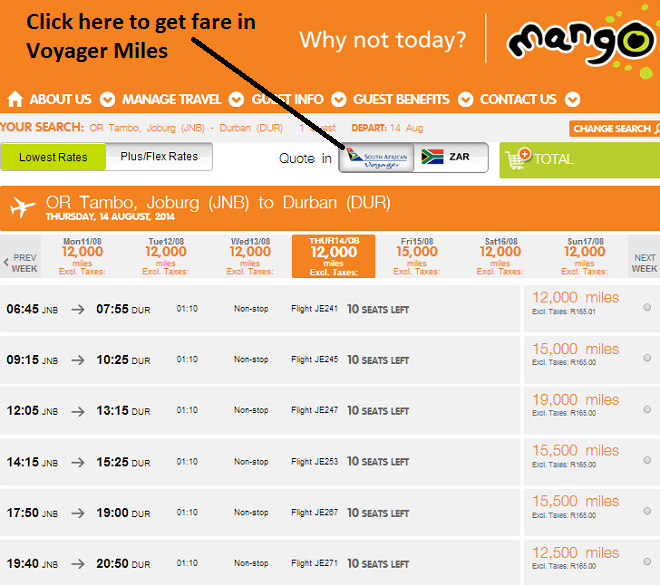 Johannesburg to Durban, using Voyager Miles on Mango Airlines flights may save you more than using them on SAA flights. If you're looking for convenience in using your Voyager Miles on flights, then spend them on Mango Airlines flights - their online system automatically shows the fare in Voyager Miles, and the whole transaction can be processed online. This research is only based on a few data points, so it's possible that some trends have been missed. The research also didn't look at alternative uses for the Voyager Miles, such as business class upgrades. It's possible that you get more bang for your buck by using the Voyager Miles for business class upgrades, but Mango doesn't have an equivalent offering so we didn't compare. Di Brown, from Jabedi mapping, suggests that SAA Voyager use automated sign-in technology, to reduce the need for yet another username and password. Many websites allow people to sign in with their Facebook or Google/+ profiles, and Voyager could easily make use of this technology. "SAA are not the cheapest carrier, I usually fly on the cheapest flight available (Mango, Kulula) The Voyager benefits would need to be great to persuade me that it is worthwhile over a period of time." Caroline Hurry, a travel writer, told us that she struggled to make use of the upgrades, and found that the cost of the airport taxes on SAA flights "exceeded the cost of a ticket from Kulula or Mango".